Ngozi Agomo had a change of heart when it came time to consider a career in broadcast journalism. After a year of AmeriCorps service in Houston, she decided that it was time for graduate school. She wanted a graduate program that would allow her to use her undergraduate education and advance her dream of being an entrepreneur while serving her community. Integrated Marketing Communications (IMC) caught her attention. She decided to pursue a graduate degree in this discipline because it would allow her to use her undergraduate education in concert with her creativity. Today, she calls it a “perfect fit” for her future. The last part was important. Agomo will tell you that there are many roads you can travel down with a graduate degree in IMC, including advertising, public relations and strategic planning. She determined that attending Roosevelt would allow her to explore more of those roads and help her fine-tune what she was passionate about professionally. Her passion for serving her community was already there, something that is common in the lives of all Rooseveltians. She was shocked when she learned that she had been selected to receive Roosevelt’s Al Golin Scholarship in Communications. She and her family are grateful for this opportunity. With younger siblings now in college, the news couldn’t have come at a better time. Her hard work was starting to pay off. This recognition and support were integral in propelling her toward her upcoming December 2015 graduation. Her benefactor’s name immediately caught her attention. When Agomo told the former news director at Illinois State University, she confirmed that this scholarship was “a big deal.” “If you know anything about public relations and marketing, when you hear the name Golin (a Roosevelt alumnus and founder of the international public relations firm Golin), you know what it’s about, here and globally,” said Agomo proudly. For Agomo, the class that opened her eyes widest was Brand Planning and Message Strategy with Stewart Young. “This is what he does in his full-time career. He was able to bring real-life examples from work into the classroom. He would ask us to give him feedback on what he’s doing at work and that’s so cool.” Before Young’s class, she admittedly wasn’t fully aware of all the strategy and planning that surrounds brand creation and development. Now, she simply can’t get enough. The area of public relations also garnered Agomo’s attention. She took Principles of Public Relations over the summer with Rashada Whitehead. “I could listen to her for hours,” said Agomo. Whitehead’s ability to connect theory with practical application in today’s workplace resonated strongly with Agomo. “A lot of professors at this university do that,” she said with a smile. 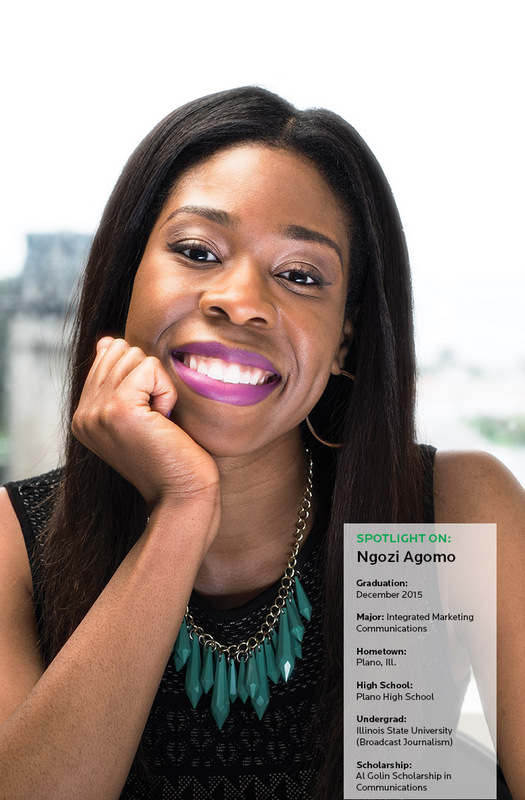 Agomo is currently working as a marketing intern at The Joint Commission, which accredits and certifies more than 20,500 health care organizations in the United States. Previously, she worked as an intern for another Roosevelt communications graduate, China Panion, handling social media and event planning in a health and wellness organization dedicated to empowering women to improve their health. “For me, it’s about encouraging and empowering people, not just women, to live healthier and happier lifestyles,” Agomo said. Now her ultimate goal is to own her own business. Stay tuned. The rest of this remarkable young woman’s story is going to be exciting and productive. Would you like to help a student like Ngozi Agomo? There are many ways to support Roosevelt students, including establishing a named scholarship. For information, visit www.roosevelt.edu/giving or call the Office of Institutional Advancement at (312) 341-4327.